Coastal cities of the east and southeast are warmer. Elevation: Highest Pt. Pico da Neblina - 9,888 ft.
Brazil is a vibrant emerging country. 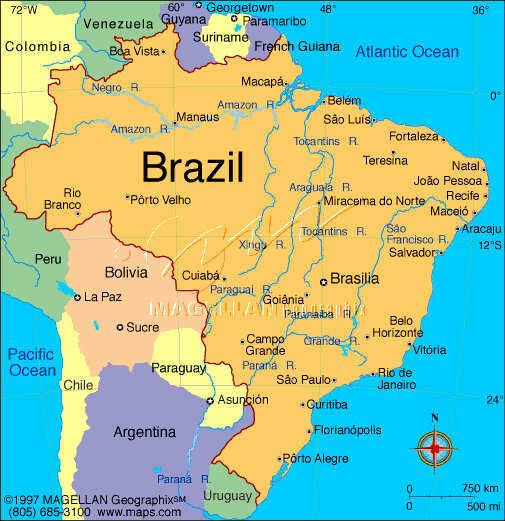 It is the largest country in South America, with about 190 million inhabitants. Portuguese is the spoken language. It is composed of 27 states. There are 1,130 active CV surgeons with 381 hospitals performing greater than 102,000 cardiac surgery operations per year. There are more than 2000 residents in 80 training programs. Following 6 years of medical school, the CV program includes two years of general surgery and four years of cardiovascular surgery. There is a formal written examination after both the general surgery and CV surgery residency periods. As experienced worldwide, there has been a noticeable decrease in medical school applicants seeking CV surgery training.